While angry young Greeks led 61% of their comrades to vote “Oxi” (No) to more austerity, Australians awoke on Monday to yet another “bees in a bottle” news story. A national poll showed only 35% of those polled approved of Bill Shorten. The PM, however, fared little better, with a personal approval rating of 36%. Shorten was still ahead of Tony Abbott in the preferred leader poll (43/39). The real story underneath these headline numbers was that 53% of the 1,402 people asked for an opinion said they preferred Labor in the two-party preferred vote. Shorten’s low approval number emerged in the same week he was quizzed by the royal commission into trade union corruption. Timing is everything. The Fairfax/Ipsos poll asked respondents to rate the leaders on 11 attributes. Bill Shorten was ahead on being open to ideas (68%), having a firm grasp of social policy (59%), having the confidence of his party (56%), being viewed as more competent (52%), and having a firm grasp of economic policy (43%). But Shorten was also seen as being more easily influenced by minority groups and those who thought he has the confidence of his party fell from 71% in November to 56%. PM Tony Abbott’s ratings improved from his poor showing in February. The proportion of those who thought he had the confidence of his party rose from 21% to 52%. But no Prime Minister had previously received such a low figure for being a strong leader (42%) and having a firm grasp of foreign policy (42%). Now seriously, fellas, if we asked our wives for an approval rating and they dished out scores in the mid-30s, we’d all have to read the blog about “the eight books that can save your marriage”. It’s enough to make a man dream about retiring to a Greek island, lazing under Mediterranean skies, living on bread, cheese and olives, drinking Ouzo and Retsina, dancing on a moonlit beach with Kassandra. You may remember the caves of Matala on the island of Crete, which were inhabited by European and American hippies in the 1960s until the churches and the locals ran them out of town. There was also a TV series in the 1970s (The Lotus Eaters), which followed the adventures of Brit expats with shady pasts, exiled on Crete and enjoying the indolent lifestyle. Yes, it has a mystique, Greece does. 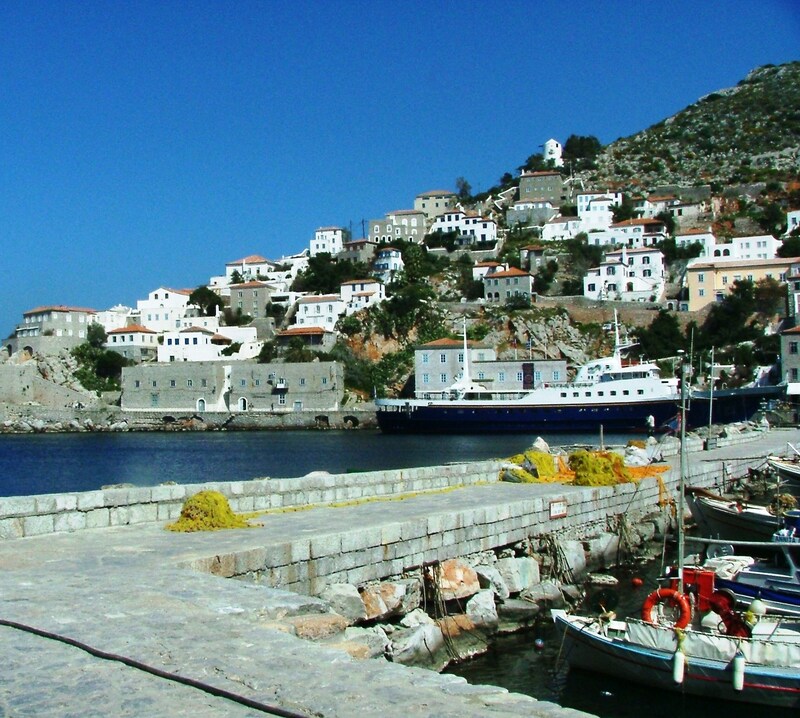 Songwriter Leonard Cohen used a family bequest in 1960 to buy a run-down whitewashed house on Hydra (above). It was here he did some of his best writing, while taking up with a girl called Marianne. We had a few adventures in 2004 travelling in Greece in the off-season, when the tourist season had not yet started. We found cheap accommodation, went in search of a local eatery in the cobbled lanes of Hydra and soaked up its sleepy atmosphere. 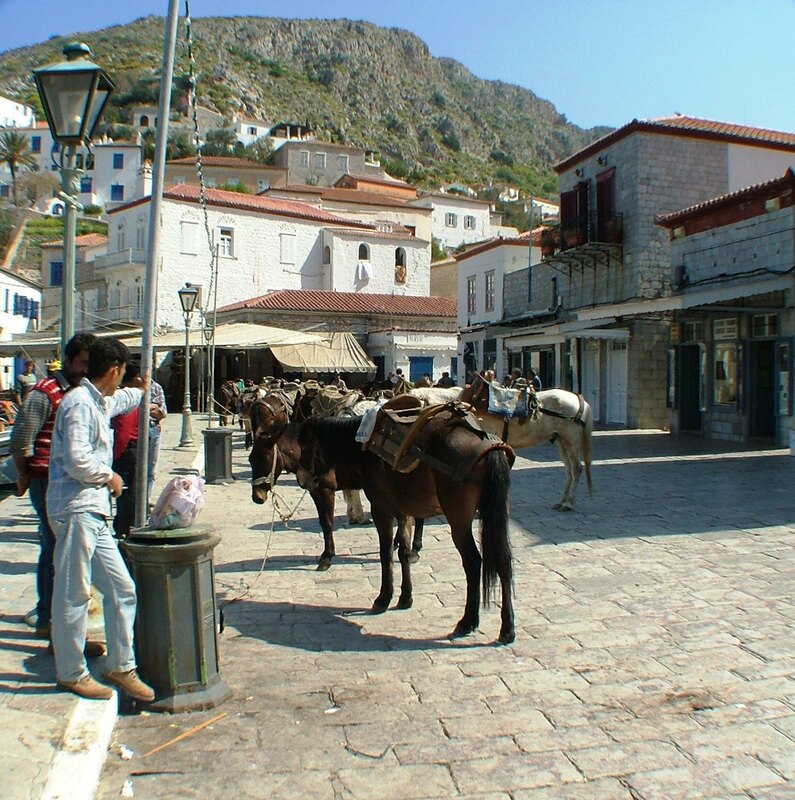 Life is slow on Hydra. There are no cars but you can hire a donkey to carry you and your bags up steep winding cobbled paths to your Pensione. Every second day or so a cruise ship the size of a 10-storey hotel slides in to port and lets tourists off to barter with locals over hand-made arts and crafts and leaves two hours later. We ordered a meal and wondered not for the first time if Greeks eat any green vegies at all. They were probably not in season in early March, but no great surprise in a country where the soil is not very fertile and only 30% of the land supports crops. Apart from the main crop (wheat), small farms produce corn and other grains, figs, olives, oranges, peaches, potatoes, sugar beets, tobacco and tomatoes. There’s a small band of FOMM readers who let me know, whenever I touch on the egregiousness of local politics, that they are seriously thinking of migrating to another country. This week I’m suggesting we take a serious look at Greece. 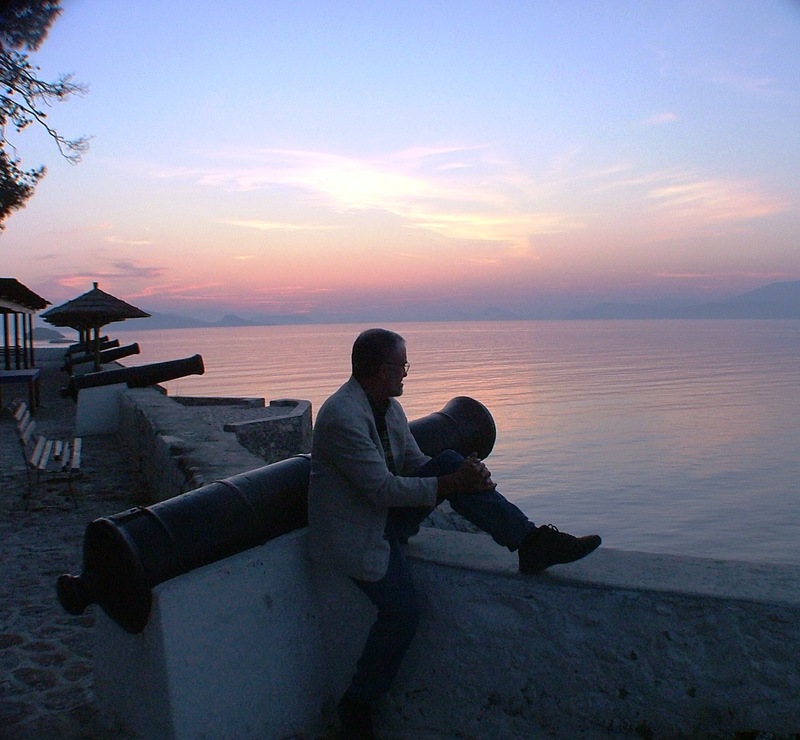 We could band together and buy a few of the 6,000-odd uninhabited islands between Greece and Turkey (upwind of Psyttaleia). Or just pick one of the under-populated ones and move in. Sure, there would be some cultural challenges, but no more so than the ones facing Greeks who came to Melbourne in the 1960s. It’s not a bad exercise, when you’re feeling disenchanted with your own country, to have a quick peek into a nation which is really not doing well at all. After four years of austerity which saw the country’s unemployment rate blow out from 9.6% to 27.4% (youth unemployment is 60%), Greeks said “No” to more austerity measures. There is much conjecture about what happens next about that country’s $317 billion IMF debt. Greek Statistics says the general government deficit, expressed as a percentage of GDP was -12.7% in 2013. Only Slovenia was in a worse position at -14.7%. Greece’s gross debt as a percentage of GDP in 2013 was 175.1%. Comparisons are odious, but Australia’s gross debt/GDP in 2013 was 14.1%, our unemployment rate is 6% and we can use 52.78% of the land mass to grow crops. Dreams of an expat-led counter-culture revolution aside, the future looks bleak for Greece. The most telling statistic shows that 23.1% of the country’s 10.78 million people are at risk of poverty. More significantly, 15.1% of those people are employed. So they are working, but going broke anyway. Sydney Morning Herald columnist Paul Sheehan blamed much of the crisis on the Greek people for refusing to reform. Greeks had made tax avoidance and welfare scamming the national sports, he claimed. As sweeping statements, go this was yard broom size, but it stirred up a few grains of truth. The Wall Street Journal carried a story in February by Matthew Karnitschnig and Nektaria Stamouli that the Greek government was owed $76 billion euros in unpaid taxes accrued over decades. Sheehan’s observations will no doubt offend Stavros and the other 378,269 people of Greek ancestry who live in Ous-tral-eah. Like us, they are keeping an eye on Greece – a foretaste of things to come in Europe, maybe, with Spain, Italy and other countries carrying similar levels of unsupportable debt. Next week: Light and fluffy. Bob. Good on you for stating the accumulated unpaid taxes. However, you didn’t mention t h e corruption in govt with $2b in bribes for $60bn in war machinery (court case in progress) & contracts for supply from Germany. Combination of corruption & unpaid taxes seem to account for such a high debt, not commoners rorting the welfare system, although that would help. A small number of people (prob big business) for a large deficit not a majority of low income earners & unemployed.